This coming weekend, March 5th – 7th, will mark the 2nd installment of Disney’s Princess Half Marathon Weekend held at the Walt Disney World Resort. This Disney Endurance Series Event is especially designed to cater to and encourage women to participate in the distance running events. Disney will help each participant find their "inner Princess" during the weekend schedule of activities. Last year’s inaugural event was wildly successful with over 6,100 women completing the half marathon. This year’s Princess Half Marathon looks to be equally successful as the registration is nearing capacity. Although the highlight of the weekend is the Princess Half Marathon which will be run on Sunday March 7th, there are events taking place throughout the entire weekend. From races for kids to The Princess & The Frog Royal Family 5K, the whole family can do more than just cheer for their favorite princess during the Princess Half Marathon. Disney’s Fit for a Princess Expo is a two-day celebration of women, focused on health and fitness! The Expo will be located in the Jostens® Center at ESPN Wide World of Sports Complex. This event will include seminars on training, racing, and nutrition, along with the opportunity to experience the latest in running and fitness equipment. The marquee event is of course the 13.1 mile half marathon. The course starts outside of Epcot and heads toward the Magic Kingdom. 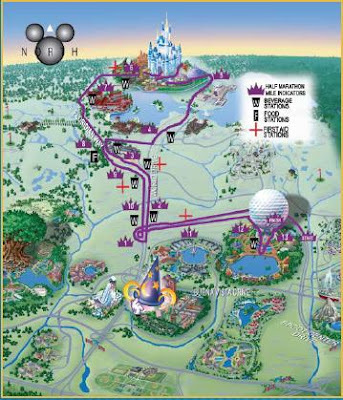 Upon entering the Magic Kingdom, the runners will pass through Tomorrowland, Cinderella Castle, and Frontierland. Then it is time to head back to Epcot and into the park, through Future World then past Spaceship Earth and on to the Finish Line. It is certainly magical running a race that goes through two different Disney World Parks. Running anywhere else just doesn't compare to the thrill you get running at Disney World. The course Map is pictured below. You don’t have to be an expert runner to participate. Although there are prizes for the top finishers, running at a Disney World Endurance Series race is much more about the experience. Runners are only required to maintain a 16 minute per mile pace during the event in order to be allowed to complete the race and receive their hard earned medal. While on the course there will be entertainment and Disney Characters to cheer on the runners. There are 18 points along the course where your family and friends can station themselves to cheer you on. There will also be over 1,000 volunteers staffing the Start Line, Course Monitor, Food Stop, Water Stop, and Finish Line locations during the Half Marathon on Sunday. This is a great event that is so much more than just the running on Sunday. The Disney’s Princess Half Marathon Weekend benefits The Leukemia &Lymphoma Society® (LLS). With the support of thousands of volunteers and participants in LLS’s Team In Training program, Disney’s Princess Half Marathon Weekend will help blood cancer patients live better, longer lives. Good Luck To All Runners! Enjoy Your Time As A Disney Princess! 0 comments to "Princesses Rule During 2010 Disney's Princess Half Marathon Weekend"